Sadly, I’m qualified to write on this topic because soon after I was promoted into a role leading other people, I quickly figured out I had no clue what I was doing. I did everything wrong, and unfortunately, my people bore the brunt of the pain associated with my lack of leadership skills. At the end of the day, leadership is a journey and not a destination. To improve your odds of success on your leadership journey, there are skills and behaviors you need before and while you lead a team. Leadership is about serving and empowering other people. No longer do you come to work for yourself or for your own self-interest. You now come to work to serve other people and help them become the best version of themselves in order to achieve more as a team. Serving others doesn’t mean being a pushover or not holding others accountable. It’s actually the opposite. In truth, you can’t effectively lead in today’s environment without it. One of the biggest mistakes I’ve made in my leadership career was not knowing what I was looking for in people. We now teach something called the Leadership Compound Theory, which shows the four characteristics we look for in people – confidence, drive, selflessness, and character – and what we expect each team member to bring to work every single day. You might be looking for different things based on your role or position, but the important thing is that you define them, communicate them and live them yourself. The same goes for leadership. If you ask any successful leader, they always will have had a great mentor at some point along the road to ask questions and learn from. The best leaders are learners. PJ Fleck, the current head football coach at the University of Minnesota, became the youngest head coach in college football in 2012. By that time, he had built out a book of lessons he learned during the seven years he spent as an assistant coach. The lessons were things he did or didn’t do when he became a head coach. That book continues to evolve and grow, five years later. The minute you think you have it all figured out or you forget to be curious is the minute your skills start to diminish. When I first started leading a team, I thought it was all about strategy and execution. I had no idea how important the culture was to the results of the team. On my Follow My Lead podcast, Step Up Leadership founder Jason Barger told me, “Culture is everything.” Culture is really all about the beliefs and behaviors that produce the results of any team or organization. The word ‘culture’ actually comes from the Latin word cultus, which means ‘to grow.’ In today’s modern business environment, that really means ‘to grow people.’ Put an emphasis on and define the culture you want to create for your new team. 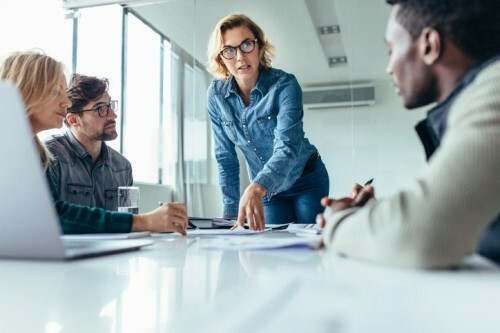 Before you accept your first leadership position and the responsibility that comes with managing other people, consider these five skills and behaviors. If you’re already leading a team, it’s never too late to start.